This is the part where stray bugaboos get gone, courtesy of Find/Replace. Time to switch over to the word processor selected for Find/Replace. Boot up the Find/Replace word processor. Open prep_projectx file in the Find/Replace word processor. Throughout the housekeeping section, work only in the hk_projectx version. First, take a look at the Find/Replace window itself. Even though this version is found in Microsoft Word 2013, most word processors are pretty similar. The circled buttons are important. People get frustrated hunting for stuff; lots of it can be found in those Format and Special drop-down menus at the bottom of the pane. The “Format” button opens a pulldown menu that gives access to just about every damn thing in the world. Have a look around in there. Extremely useful stuff. Likewise the “Special” button, but since this tutorial uses text shortcuts instead, there’s no need to venture in there. The “No Formatting” button clears any formatting applied to the find or replace fields. “No Formatting” remains grayed out unless the cursor is parked in a field with formatting applied to it. So basically, you can’t clear formatting unless there’s formatting to be cleared. 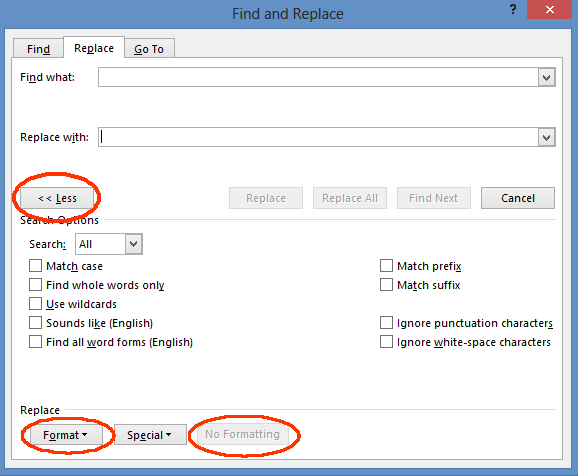 Word keyboard shortcut to open the Find/Replace window: ctrl+H. Meet the caret mark. ^ Find it on the keyboard. It’s shift+6. This awesome little bugger tells Word to look for a non-printing character. I have no way of knowing which word-processor you’re using. The steps to load your Find/Replace fields might differ. Google is your friend. REMEMBER: Work only in the hk_projectx file version. Perform these Find/Replaces in the order listed. Replace: (Make sure this field is completely empty. NOTE: This F/R was temporarily removed from the tutorial because tabs do not survive the drop into the plain-text editor. On the other hand, I do understand the argument that there’s always the odd word processor that might do something weird, so this step has been restored, just in case. Yes, I know your entire book just got mushified. Chill.